Newlyweds Priyanka Chopra and Nick Jonas recently attended the premiere of ‘Isn’t It Romantic’. The diva looked stunning in a strapless Vivienne Westwood which she teamed up with a pair of Jimmy Choo heels. Hubby Nick looked dashing in a grey t-shirt with a brown pantsuit. Their adorable PDA on the red carpet was loved by their die-hard fans. 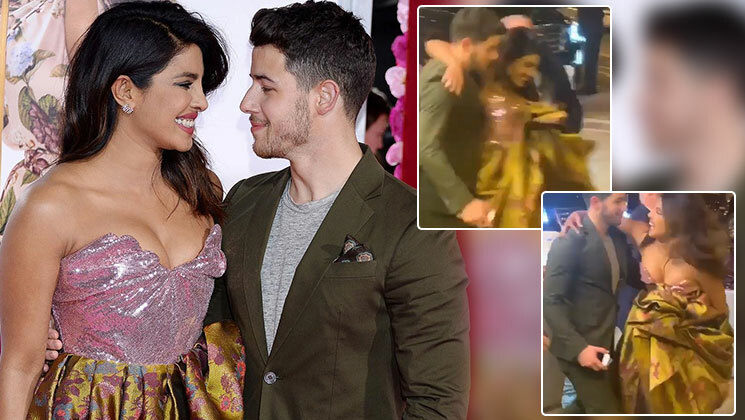 What made Nick an idol in the eyes of Priyanka Chopra‘s fans is when he saved his wife from an embarrassing moment there. The video soon went viral on the social network with fans gushing over Nick’s knight in the shining armour act. Global icons Priyanka Chopra and Nick Jonas, who tied the knot last year in December, are presently in Los Angeles, California enjoying marital bliss. The power couple tied the knot on December 1-2 in a fairytale wedding which took place at Umaid Bhawan Palace in Rajasthan. The power couple had two weddings ceremonies, one as per Hindu traditions and the other as per Christian rituals. Post their wedding, the duo have been spending as much time as possible with each other. On the work front, Priyanka Chopra’s Hollywood flick ‘Isn’t It Romantic’ also features Priyanka Chopra, Tom Ellis, Liam Hemsworth, Rebel Wilson, Adam Devine and others in pivotal roles. She also has Shonali Bose’s ‘The Sky Is Pink’. The movie also stars Farhan Akhtar and Zaira Wasim in lead roles.